Hartwell Lake Hartwell Lake is one of the largest lakes in the southeast and one of the most popular public recreation lakes. Hartwell was built by the US Corps of Engineers; between 1955 and 1963. It borders Georgia and South Carolina on the Savannah, Tugaloo, and Seneca Rivers and comprises nearly 56,000 acres of water with 962 miles of shoreline. The Hartwell “Project” was originally authorized for three purposes: hydropower, flood control, and navigation. The Lake Hartwell Dam in Hartwell, Georgia, began in 1955 and was completed in 1959. The Lake didn’t reach the full pool elevation of 660 feet until March 12, 1962. The average depth is 45 ft., but can get as deep as 185 ft. Since it opened to the public, millions have used the many parks, marinas, and campgrounds. Hartwell has a variety of fish, such as, Stripped Bass, Bream, Smallmouth Bass, Walleye and Largemouth Bass. Hartwell is also a birdwatchers paradise with over 250 species of birds. Bring your fishing pole, bathing suit, binoculars, hiking shoes, or whatever it is that you might need in order to do what you love most, but most of all. . . bring your sunscreen and enjoy some relaxing time on the lake! In February 2015, the newly completed Green Pond Landing in Anderson, SC served as the blastoff site for the “2015 CEICO Bassmaster Classic”. This is a three-lane concrete ramp that measures more than 280 feet long. 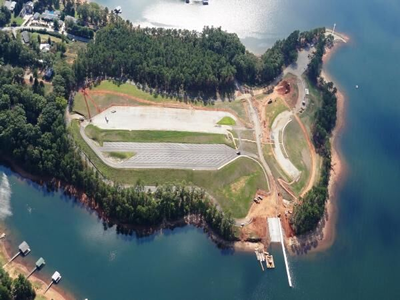 It has 166 parking spaces for trucks and boat trailers, as well as, a 250-foot floating boat dock and 113 single spaces for spectators and co-anglers. It is located just off Hwy. 24. There are several State parks on Hartwell. They include Lake Hartwell State Park, Tugaloo State Park, Hart State Park, and Sadler’s Creek State Park. They offer an array of things to do and see, such as picnic areas, campsites, swimming spots, hiking areas, etc. You need to just check them out!